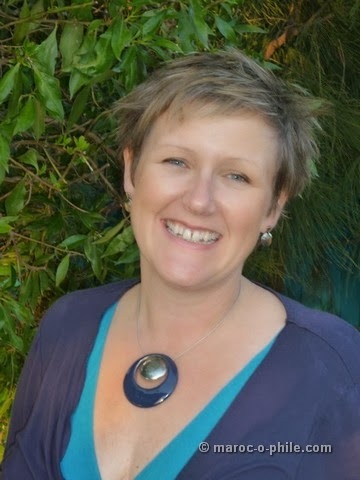 We are thinking about meandering up the coast to Essaouira this summer and thought it would be good to get some inside information – maroc-o-phile Lynn Sheppard is lucky enough to live there, and seemed like the perfect person to ask! 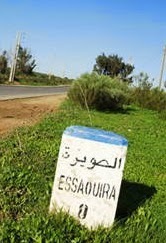 If you come to Essaouira on a warm, sunny day then you’ll probably want to spend it on the beach. If however, you were to be here on one of its reputed breezier days, how might you spend it? 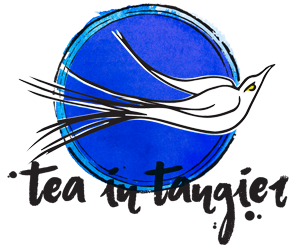 Check out local art…. 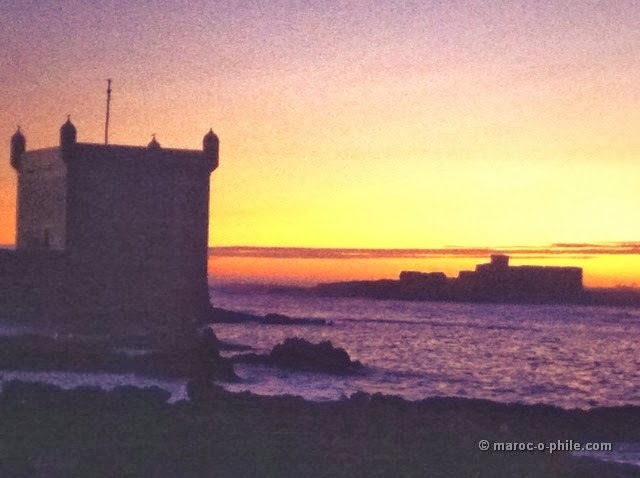 Head into the Rapunzel’s turret that is the Bastion Est, managed by local artist Ahmed Harrouz. 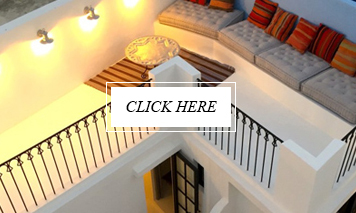 Climb up to the roof and admire the view over the Atlantic Ocean and the bustling port. It’s one of the best – but least known – viewpoints of the city. 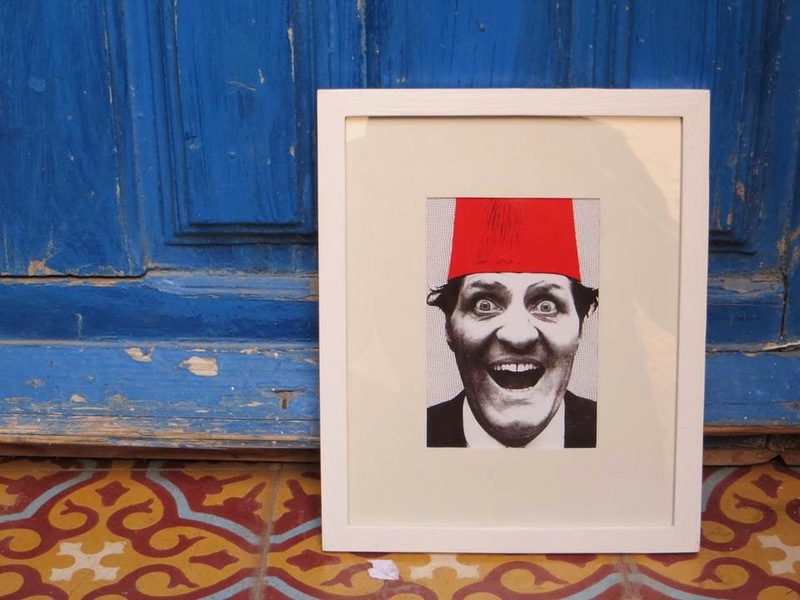 If art is your thing, check out the local naïve style at the gallery on rue Houmman el Fatouaki in the Mellah Kdim. 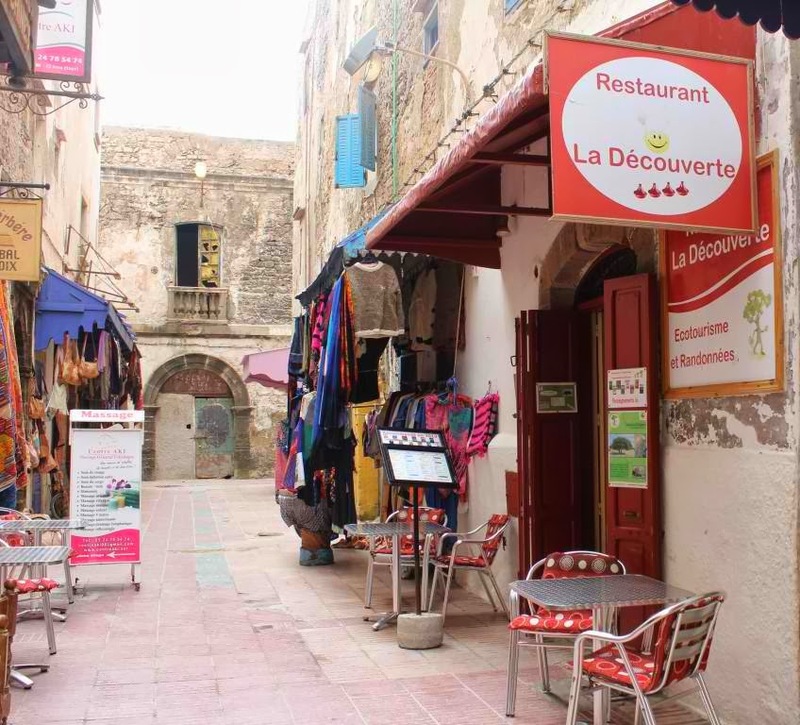 It’s opposite La Decouverte, which is a great spot for lunch, serving daily specials of homemade dishes of locally-sourced ingredients. 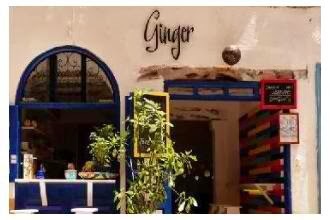 Pause for a coffee….. at Ginger, run by an Argentinian couple and serving fresh juices, smoothies and salads (Rue Ibn Rochd in the Kasbah). 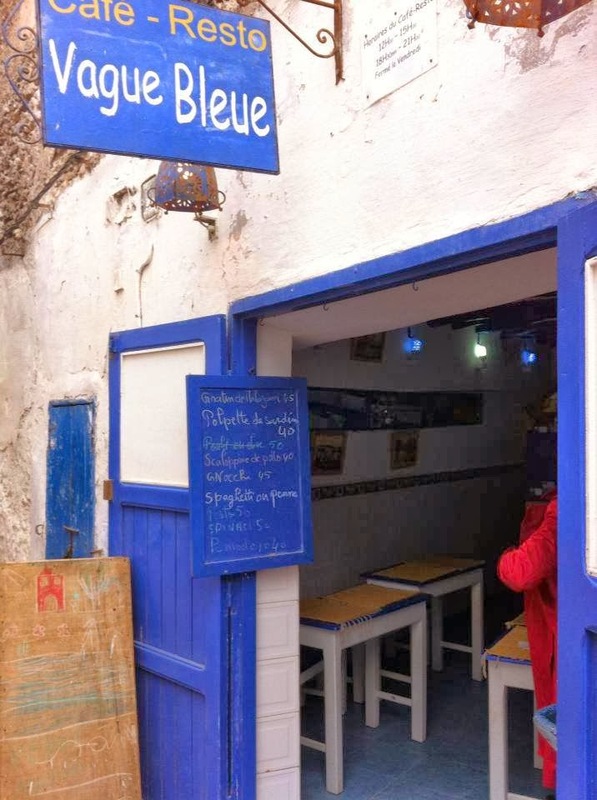 For something a bit more “local”, check out chez Bachir on the main square – his is the café nestled in against the wall and enclosed by a series of awnings. 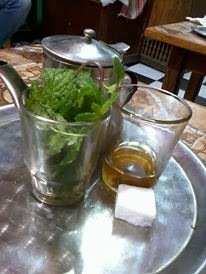 If mint tea isn’t your thing, order a nouss nouss (literally, half-half espresso and milk). Surely by now it’s time for lunch? 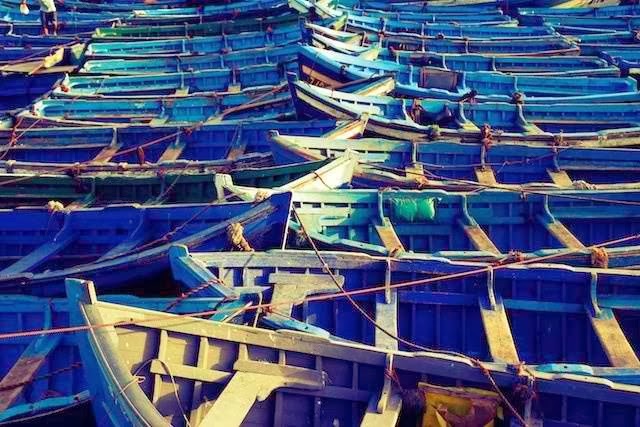 Essaouira’s blue flouka fishing boats set off at sunset to chug 6 hours into the Atlantic. They fish for 5 hours and arrive back at the port around midday. 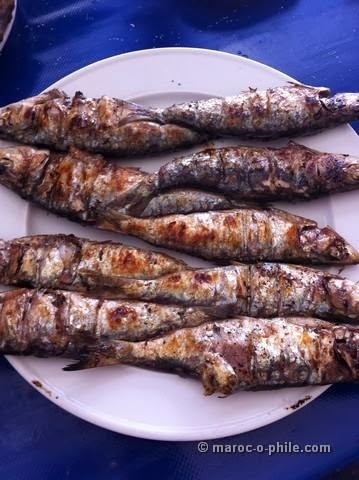 Souiris (as the locals are known) believe sardines are best eaten immediately. Buy them at the quayside or in the fishmarket (Souk Jdid) for around 5dh a “packet” (5-6 fish), pick up some lemon, tomato and cucumber from the veg souk, and head over to one of the many BYO restaurants on the other side of the main road to have them grilled. 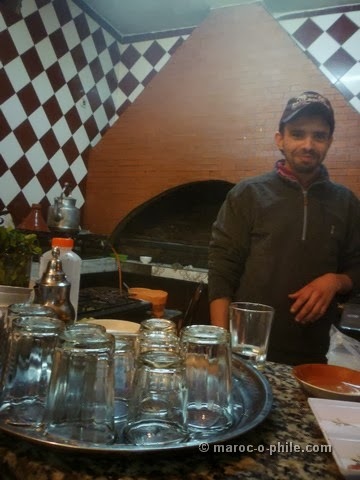 I recommend Mohammed at the Tamilalte kitchen – there’s even a little roof terrace. If you feel the need for a postprandial stroll… Take a walk along the ever-improving seafront promenade. 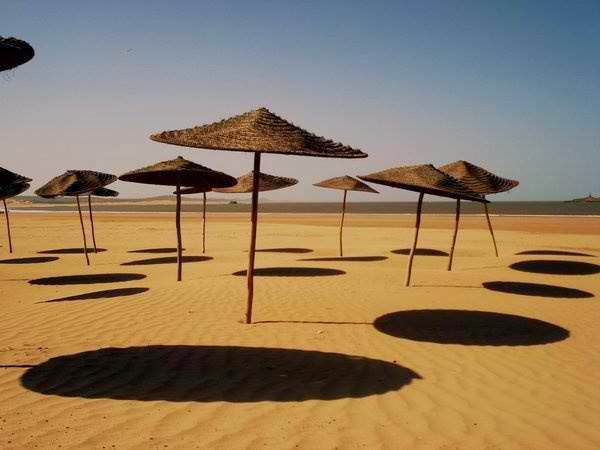 About half an hour out of town, you’ll find a parade of cafes and watersports schools plus some camels, quad-bikes and horses for hire. Ocean Vagabond is a bit more upmarket, in a lovely garden setting and great for families. My favourite is Café Tamouziga. The pizzas are great and the sunloungers are free. 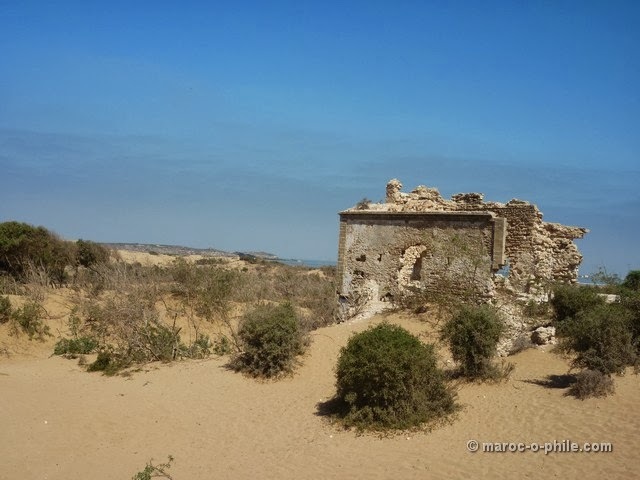 If you still have the energy, it’s worth the walk on into the village of Diabat: not to visit the alleged pausing point of Jimi Hendrix but rather the beautiful ruins of the Sultan’s Palace, slowly being reclaimed by the dunes. It’s a fabulous setting for sunset, but you’ll need a torch to find the road again and you might not easily get a taxi back into town. 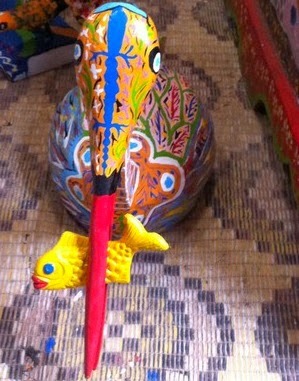 For an out-of-the-ordinary souvenir…. Try the Sunday flea market (joutiya) for second hand carpets, crafts and other items. 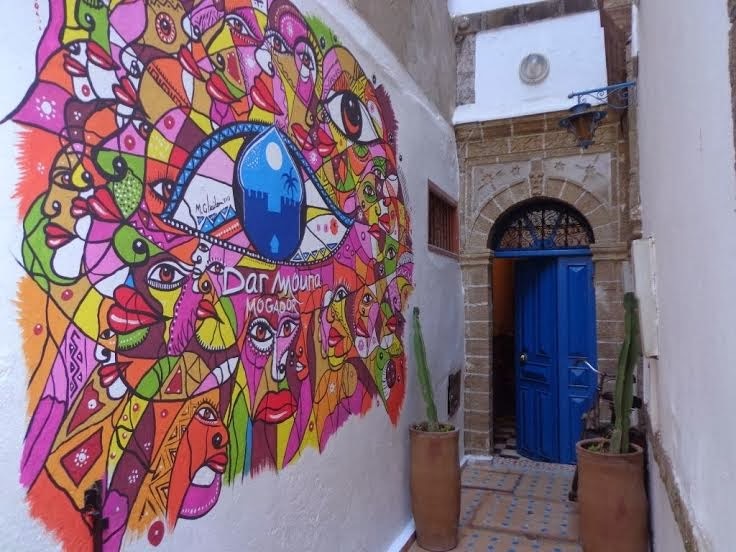 Check out the Mashi Mushki shop on Rue Chbanate for gifts with a social conscience – it’s run by the same people as the Dar 91 rental property and they encourage you to “leave your wardrobe in Morocco” so they can sell your unwanted clothes in their Project 91 shop. Sunsets over the Atlantic are the best…. And best enjoyed with a beer in hand. 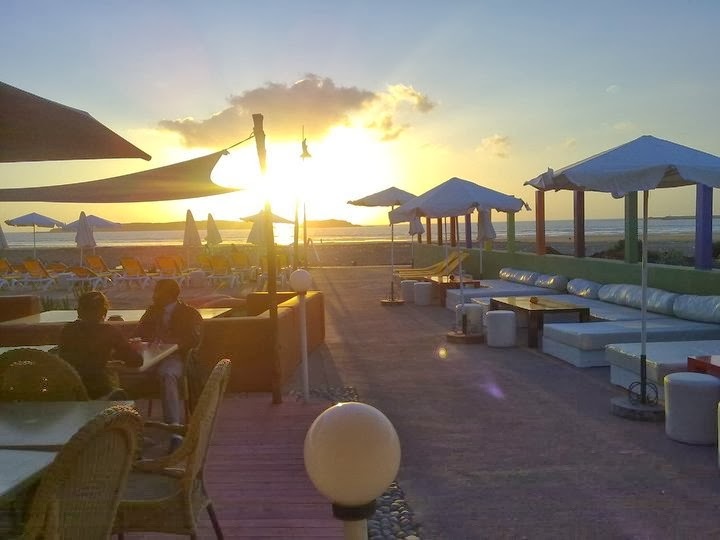 Try the vantage point of the Barcelona bar beside Chalet de la Plage – it’s cheap, cheerful and filled with a mix of locals and backpackers. For a different perspective (and budget), Il Mare overlooks the medina fortifications (skala) and has an early evening 2-for-1 deal on drinks. The best setting for dinner is…. Elizir. It’s well-reviewed and often full – book in advance. If Sophia Loren was your granny, this would be her front room (Rue Agadir). Teeny tiny and less well known (so far) is Vague Bleue off Souk Waka (Rue Mohammed el Quory), which serves excellent Italian food at extremely fair prices for lunch or dinner, with appetisers and fresh smoothies thrown in. Both restaurants offer plenty of alternatives to tajine! Surely you’re tired by now? 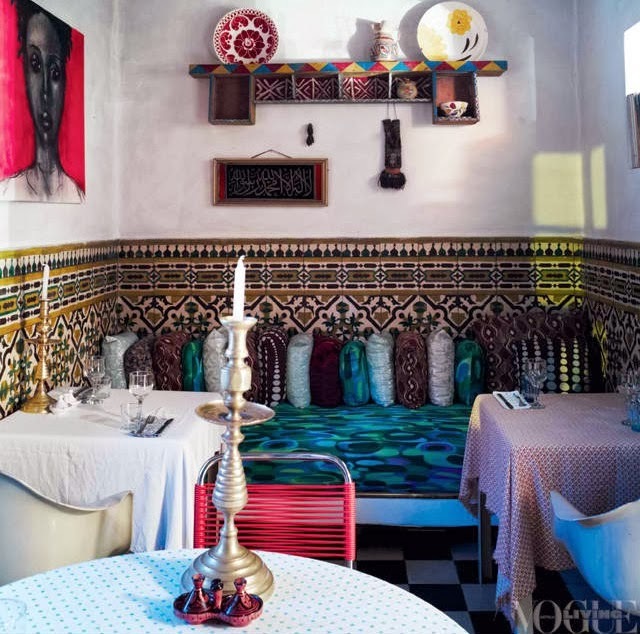 New kid on the block, Dar Mouna Mogador, is rapidly embodying the Souiri artistic vibe and is run by travel industry veteran and general font of all local knowledge, Jane Folliott. 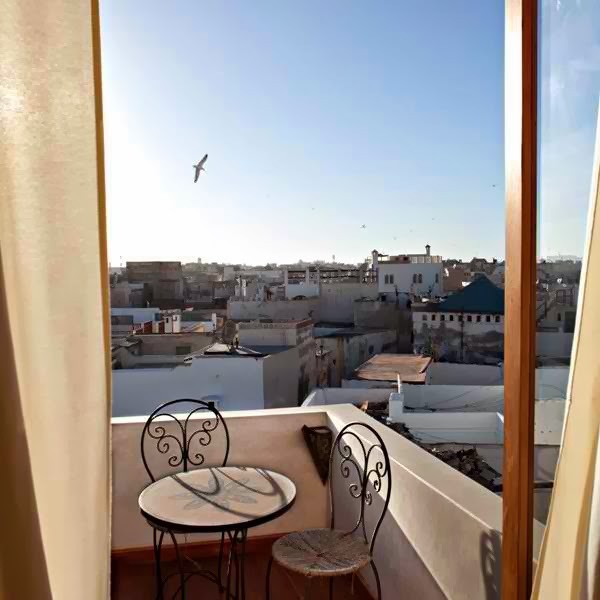 Double rooms are priced at 600dh for a double including breakfast on the roof terrace. If you fancy treating your other half to a romantic getaway, check out the roof-top Suite Chbanate at Riad Chbanate with nigh-on 360° views, including from the bath!